An article in Immerse Journal by Ben Kerns reminds us that using things that are popular and well understood to explain spiritual truth is important. As our cultural context becomes increasingly post Christian, we too must become cross-cultural missionaries and find relevant translations and applications to help our students understand the spiritual realities presented in Scripture. Even Jesus used parables to help bridge the gap between where his students were and the truth He was trying to explain. The article in Immerse Journal mentions using zombies, which I thought was a great idea and jotted it down as a future blogging idea. Why? The undead are not just for students. Zombies are a popular topic at the office and many colleagues have a copy of one the graphic novel volumes – “The Walking Dead” on their desk. So, how does someone identify a zombie? Here are some tell-tale signs. Like zombies, you might look alive because you move around and eat stuff but in reality you are dead. You have no real life in you and you need to wake up! Wake up and do what? Remember. Remember what? 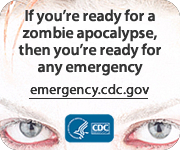 How about Zombie Land Rule #22 – when in doubt, know your way out. If you are feeling a bit undead and want to know the way out then I recommend – the Few, the Humble, the Reborn. Of course knowing your way out doesn’t do much good if you don’t actually use it. Jesus warns the faithful who are in the church at Sardis that they are out-numbered by the “undead” that surround them. Remember, it is no fun being in the middle of a zombie horde, but survival chances are better if you keep Zombie Land Rule #8 in mind. Get a *great* partner. The One who will always be with you and has conquered death and claimed victory over it sounds like a good choice to me. Just a bite and you could have a serious problem. One generally becomes a zombie as the result of being infected from a plague. And it does not take much to become a zombie, usually just a bite. So one must be on guard. Get too close and you may find yourself with a limited vocabulary (as in “braaaiiinzz”). Best advice here is to avoid them. For those who are running well and are among the faithful few in Sardis here is one more tip – the (unofficial) Zombie Land Rule – it’s a marathon, not a sprint. Unless it is a sprint, then sprint. Remember zombies are slow, so no need to waste energy living life like its the 100 yard dash. Most of the time you just have to stay alert and run life like a marathon- with endurance and the right focus. However there are those times when you just gotta run like your life depended on it!